Becoming a new parent comes with making decisions. When having a daughter a big decision will be ear piercing. Do I pierce her ears now or later? This can be a controversial issue as some parents rather wait until their child asks for their ears to be pierced while others prefer to do it early on. When is the right time? For some cultures, ear piercing happens right in the hospital while others may still do it when the child is an infant but wait until they have had their shots. Some believe the earlier they pierce the child’s ears, the easier it is to take care of the newly pierced ear. Meanwhile, others may wait until the child asks for their ears to be pierced. While there is many different opinions about when the right time is, the important question is – which way is the safest? In the United States, there is little knowledge about ear piercing. Most may find themselves at a jewelry store, tattoo shop, or at a kiosk in the middle of the mall. None seem appealing. Besides location, it is important to know who is piercing, what are they piercing with, and what are the earrings made out of. Many of these locations throw out the words “nickel free” or “hypoallergenic.” Sounds safe, right? Surprisingly, anyone can claim that an ear piercing stud is nickel free or hypoallergenic in the United States even if it is not. It is not regulated! Why is it important to be pierced with an ear piercing stud that is nickel free? For a majority of people who suffer from nickel allergy, it is caused by a single ear piercing. If one is pierced with an earring that has nickel in it, they can become sensitized to it. This means that they got pierced with an earring that eventually will cause them not to be able to wear earrings at all. Nickel allergy can vary for everyone. Some may feel itchy while wearing earrings but are able to wear them still while others are severely uncomfortable and cannot wear earrings at all. Increasingly over the years, parents are looking for a safe piercing alternative. Now, many medical professionals will provide ear piercing for their patients. Getting your child’s ears pierced by a medical professional in a private exam room sounds a lot better than the middle of the mall, right? Not only is the location safer but the system and materials are safe as well. Many of these medical professionals use the Blomdahl Medical Ear Piercing System (which is only available to medical professionals!). This system uses single use disposable cassettes with completely sterile earrings. This eliminates the chance of causing infection or spreading blood borne viruses. Blomdahl’s system also uses the safest materials. 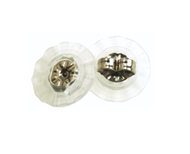 The ear piercing studs come in two materials, Medical Plastic (a patented 0% nickel ear piercing stud) and pure medical grade titanium. They are earrings that are actually nickel free! This eliminates the chance of starting a nickel allergy. Despite, the complicated question of when to pierce or when not to pierce , no matter when you pierce your child’s ears it is important to choose the safest way.